How to troubleshoot print freeze? 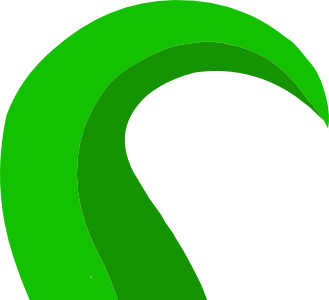 Okay... restart OctoPrint and see if it's now happy. The octoprint.log (for the timestamps after the restart) should not throw an error for that plugin especially after starting a job. Restarted it all. Did not print yet, but it does not stay connected. 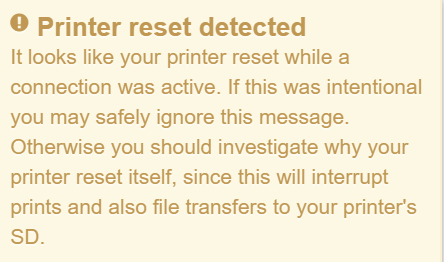 I get a printer reset detected warning. I got those before, just did not mind them. I connect to my printer and in few minutes I get disconnected again. Either the printer reset because it lost power or it's possible that the serial connection got bumped or otherwise lost its connectivity somehow. It feels like it's not the Raspi in this case, for what it's worth. I'd say, review the connection again and make sure that it's firmly attached for the serial cable. Then review the power for the printer controller board and make sure that it's also firmly attached. It would be nice if everything was plugged into a UPS so that there are no brown-outs on the incoming power (a possibility as well). Thank you . The printer and raspi are on the same UPS. I also do not think it is the raspi. I an due to replace the fans in the printer control box this week, and will review all wiring on that board, then update firmware. Funny thing: The printer itself is printing fine from SD (sans octoprint). Just finished a 6 hour job and not a glitch. For what is worth, I also tried to use a USB powered hub in between raspi and the printer. Got the same issue, randomly stopping communications and print. That's starting to suggest a serial problem then. The problem was solved by replacing the PI. I got a PI 3 B this time and worked fine. So,or I got a defective 3B+, or there is a bug using it. Just to know, I re-purposed the 3B+ into my home automation and it is working 24/7 for 2 weeks now. Go figure.